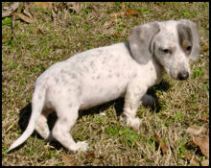 The piebald dachshund is one of several patterns that appear in the breed such as dapple, double dapple, sable and brindle there are also a variety of other coat colors. The piebald pattern is very eye catching and has become very popular with dachshund enthusiasts today. 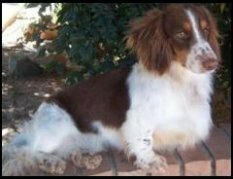 This pattern is bred in all three coat varieties smooth, wire haired and long haired. There are no health issues as far as we know with this coat pattern. Although the American Kennel Club removed the piebald pattern from the breed standard some piebalds have won US titles in competition so there is still some controversy about this decision. show some of the colors that are found in this popular pattern. A cute black and cream piebald puppy. A chocolate and cream piebald from Ghost Trail Dachshunds. The piebald pattern consists of areas of solid color over a white base coat; most have a white tipped tail, sometimes they have small spots or flecks on the white this is called ticking. Here is Blaze a blue and tan piebald,with ticking. 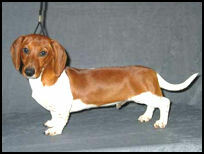 A smart red smooth piebald dachshund from Cedarhurst. Regular piebalds will have 50% white color. 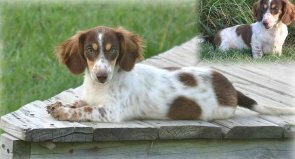 With this pattern the dogs will always have brown eyes; it is only in the dapple piebald that you may get one or both blue eyes. To breed a piebald both parents both must carry the piebald recessive gene, unlike the dapple, sable or brindle where you only need one parent. Two true piebald parents will produce a whole litter of piebald puppies. This is Cocoa a lovely chocolate and tan piebald from Grendox Dachshunds. The sable is not a common pattern and is difficult to identify and describe - each hair is made up of two colors a red sable will have red hair with black tip. This pattern appears in the long haired and sometimes the smooth haired dachshunds. Dakota a long haired red sable doxie from Judy Kay's Dachshunds. Peaches a long haired cream sable from Judy Kay's Dachshunds. Brindles have irregular usually black or chocolate stripes over their main coat color. Brindle puppies come from at least one brindle parent, the red brindle is the color most often seen. Brindle dachshunds appear in all coat varieties smooth haired, wire haired and long haired and in both miniature and standard sizes. Brindle pattern can sometimes appear simultaneously with the piebald pattern, to make an interesting marked dog. American Kennel Club allow for only one pattern or one color per dachshund except for the Brindle/Piebald which has its own color code.